A general view shows debris and car wreckage following the explosion of a bakery on the corner of the streets Saint-Cecile and Rue de Trevise in central Paris on January 12, 2019. Two firefighters and a Spanish tourist were killed by the blast and about 10 of the 47 wounded were in critical condition. The Paris prosecutor's office says rescuers have found a body under the rubble of a bakery in Paris that was blown apart by a powerful explosion, bringing the overall death toll to four. 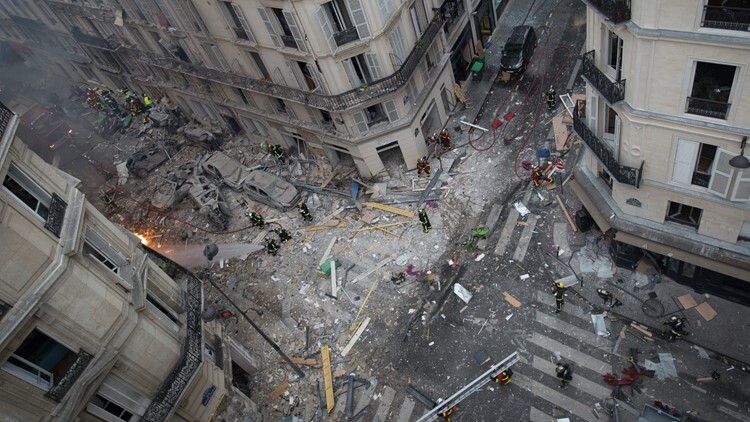 The blast Saturday morning in the Rue de Trevise in the 9th arrondissement of north-central Paris also injured dozens of people. Authorities say 10 of them are still in critical condition. Paris fire department spokesman Eric Moulin told reporters about 30 firefighters were at the site Sunday to search for other potential victims, amid a mountain of debris and wrecked cars. Paris authorities said 12 neighboring buildings that were damaged by the blast apparently due to a gas leak have been evacuated. Temporary accommodations were provided for about 40 residents while dozens of others have been housed by family and friends. Oleg Cetinic, Milos Krivokapic, Mstyslav Chernov in Paris, and Frank Griffiths and Nishit Morsawala in London, contributed to this report.